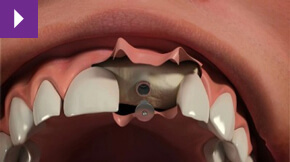 Dental implants are a common, permanent solution for one or more missing teeth. There are many reasons we see patients with missing teeth, from accidents and injury to advanced gum disease or decay. Whatever the reason, we know that if you’ve lost a tooth it can make you self-conscious about your smile and affect your overall self-esteem. There are more than just aesthetic reasons for replacing missing teeth, however. If a tooth is lost the bone beneath it will eventually begin to shrink back. Other teeth will drift into the gap, causing problems with how you bite and chew food. Unlike other missing tooth solutions such as unsecured dentures, dental implants act much like the root of a natural tooth, assimilating with the bone and preventing it from shrinking. A dental implant is a titanium post or screw placed in the jaw bone to replace a missing tooth and to support replacement teeth in the form of crowns, bridges or secured dentures. We don’t place the implants ourselves in the practice, but refer the surgical side of treatment to experienced implant surgeon Dr Emiliano Zanaboni. At Smilecraft we then restore the implants with crowns, bridges or dentures. We use the 3i Encode coded Impression System, which streamlines the implant process, reducing your time in the chair and improving accuracy. After taking impressions of your mouth we send the results to our lab in Barcelona, where models are made up. These models are sent back to our UK lab to make your replacement teeth. The healing abutments that were placed at the time of implant surgery are then removed, and your new teeth are attached on top. For more information about dental implants or to book a consultation to see if they are suitable for you, please contact the practice today. You can also read testimonials from many of the happy implant patients we have treated previously.